The ultimate Broadway bootcamp is back! Designed for kids who can’t stop singing showtunes, this full day camp is run top to bottom by seasoned Broadway professionals. 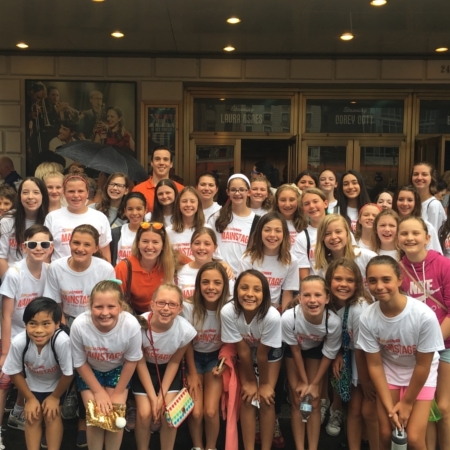 In one week, participants will learn and put on an abridged version of the charming classic Singin’ in the Rain Jr. – and on Wednesday, experience the magic of Broadway first-hand with a Hampton Jitney-chartered trip to the city to see a hit new Broadway show, and a taste of some of the behind-the-scenes magic. This year, we are seeing the critically acclaimed Broadway revival of Once on this Island. This week is simply a “must” for our Broadway loving students!